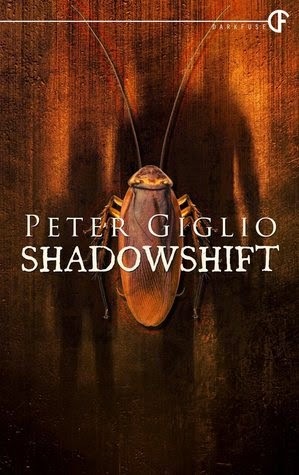 Shadowshift is a novel that opens with an ominous, ambiguous sort of scene, one in which a shadowy figure delivers a young child to a grateful couple. It could be a back-alley type adoption, a rescue situation, or a child trafficking sort of scenario. The fact that we don't know what's going on serves to immediately unsettle the reader, causing us to question everything that comes after . . . and for good reason. From there, the story leaps ahead, introducing two separate plot-lines that are separated by a few years. It takes a while for them to converge and overlap, but it's an effective way to tell the story. It allows Peter Giglio to show his characters at their best and their worst, to introduce something of an early cliffhanger, and then to string us along for a while, making us wonder how it was resolved. We see Chet and Tina unhappy and poor, and then Tina and Hannah happy and comfortable, with the questions of how and what happened to Chet looming large between the two plot-lines. It's a narrative framework that creates some real tension and suspense, and which does so naturally. Along with the two plot-lines there are really two very different stories being told here. One is a rather standard story of a long-suffering couple, a life of crime, an escalating pattern of domestic abuse, and an inability to trust in happiness when it does come along. It's a sad, tragic kind of story, at is a little heavy-handed at times, but it really serves to establish the human element to the novel. It carries a suspense all of its own, especially as it causes us to question and doubt Tina's new-found happiness and wonder whether it's too good to be true. The other story being told here is one of supernatural talents and shadowy conspiracies. Chet is a man with the ability to shapeshift into a cockroach, while his daughter has the ability to control electronics with her mind. Dad likes to scurry beneath locked doors as the perfect thief, while his daughter just tries to make her difficult life a little more tolerable. It's definitely the coolest part of the novel, but it carries with it a deeper, darker suspense of its own. As we discover, their talents are in their blood, and that shadowy figure from the opening chapter is part of an organization dedicated to eradicating that bloodline from the world. 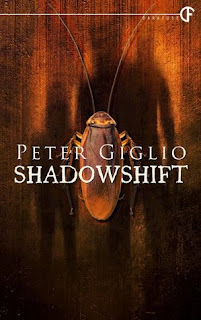 Overall, Shadowshift is a strong, well-crafted novel that manages to build and maintain the suspense throughout. The characters are well-developed, and as cool as the supernatural element is, it's never allowed to overwhelm the human story. There were a few things that nagged at me - like why a greedy man like Chet didn't use his talent for bigger scores, and why a lonely young girl like Hannah was so reserved with hers - and I felt there were a few too many epilogues, when the story could have ended more powerfully without being to tidy, but that didn't keep me from turning pages late into the night. Shape shifts into a cockroach? Now that is unique.